The issue of climate change is a somewhat nebulous one to picture. We know that on the whole, our global climate is changing, but those changes will manifest differently depending upon geographic location. Some areas are expected to grow hotter and drier, others colder and drier, and yet others warmer and wetter. Climate change will not look the same across the globe, and that has significant implications for each country's mitigation and adaptation strategies to best cope with this unprecedented challenge. In order to help governments plan their climate change adaptation strategies, a team of scientists recently published their research on the subject, along with a global map illustrating the variation in climate change susceptibility. Dark Gray: highest level of climate stability and intact vegetation. 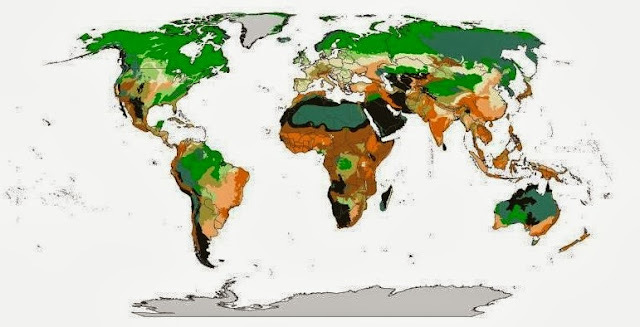 These are the areas projected to experience the least effects of climate change. As all of us well know, there are some experiences in life that, once we've gone through them, forever divide our life story into "before " and "after". Major events such as getting your driver's license, getting married, having children, losing a loved one - all of these are instances where our lives "after" the event are radically different than they were "before". 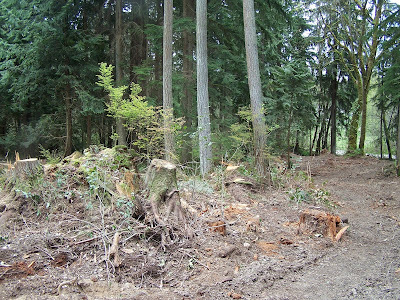 This phenomenon came to mind during a recent hike as I realized that there is another "before and after" in my own life: nature experiences before my ecology education, and nature experiences after my ecology education. I found that going on a hike armed with knowledge about the ecological history of our region was a much different experience than when I had hiked it previously, in blissful ignorance of the history that was writ in the scenery all around me.